When reviewing our stats to see how people find Eco Child’s Play, I’ve discovered that many parents are looking for ways to clean their children’s toys naturally. I thought I would share a few of my tips with you for soft, wooden, or plastic (ugh) toys. My methods are gentle for the earth and your family, as I don’t use harsh chemicals like bleach water, yet they may not kill viruses such as HIV and RSV. Should plastic toys have crept into your home from well-meaning relatives, many of them can be cleaned in the top row of the dishwasher. This is the suggested method in a preschool curriculum I used to follow. This is a simple manner of cleaning them, but it may not lighten your impact on the earth. Washing them by hand in a sink full of soapy water may be a better option. , which I assume if it is safe enough for my children’s dishes, it is safe enough for their toys. Wooden toys should never be soaked in water for long and should be dried immediately, otherwise, the wood can swell and the grain may rise to the surface. off two solar panels. Front loading machines are more gentle on items, and I have yet to have a plush toy fall apart when washed in cold water. Just like every other aspect of cleaning your home, toys can be cleaned naturally. The best part about using natural cleaning products is you don’t have to worry about your child being harmed while they help you. Have you seen those horrible images of a boy with a terrible rash from a Mr. Clean Eraser Sponge? 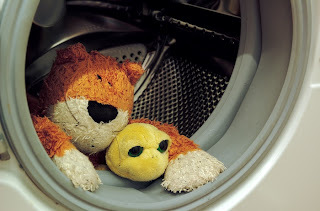 A couple suggestions for parents of children with asthma and allergies (like mine) – wash any stuffed animals that they sleep with (along with all their bedding) in hot water (cold & warm water unfortunately don’t kill dust mites, which is the world’s leading cause of asthma symptoms). I know it isn’t as earth-friendly as a cold water wash, but the kids’ health comes first in this case. If you don’t think they can withstand hot water wash (I wash things in hot water in my front-loader machine even though the label says not to and I haven’t had a problem yet), put them in a plastic bag in the freezer for 24 hours – this will kill dust mites & any other stray bacteria. Thanks for the suggestions anonymous! I didn’t know dust mites could be killed in the freezer. A cleaning method that wouldn’t kill HIV? I believe exposure to the air should be enough to do that. Thanks for the post. I couldn’t agree with you more. I run a small daycare out of my home. I found that using white vinegar to clean toys and my home is as effective as using harsher cemicals. White vinegar will kill bactria and viruses just as well as lysol or clorax but with out hurting anyone. I second the vinegar. (I use this as a laundry booster as well to help with stains on my toddler’s clothes.) If you aren’t too keen on the vinegar smell (like my husband), I recommend adding a few drops of an essential oil, such as lavender, lemon or tea tree. These aid the germ-busting, as they are anti-bacterial, anti-viral and anti-fungal. Are phthalates in plastics causing a rise in juvenile high blood pressure?